This blog contains many errors, some of them fundamental to the analysis. (1) Invisible Ball vs. (8) Is This Earth? I have always felt Hockey was a faster version of Soccer played on Ice and with an invisible ball. Thoughts/context: Top overall seed managed to hold off its opponent despite the unfortunate timing of R2. Thoughts/context: T$$D still has not answered the initial question. Thoughts/context: This one was a bit underseeded from the start, apparently. 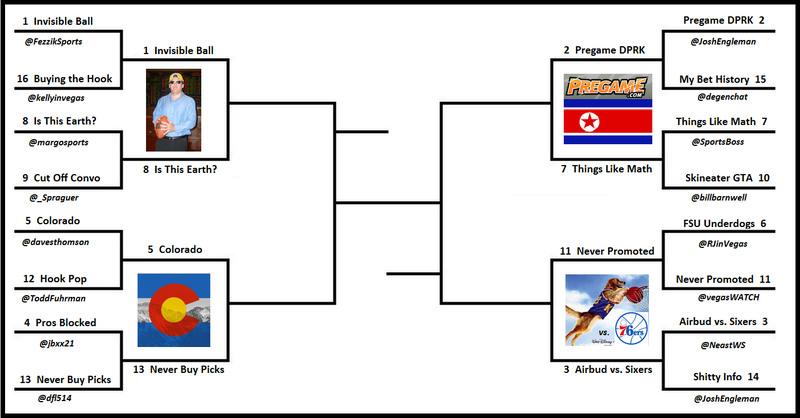 @DieHard4BigBlue @WagerMinds @RJinVegas @jasonrmcintyre Pregame is EXACTLY like North Korea. But seriously tweeps its little things like that doing MATH when gambling that makes diff btwn winning & losing - so many cannot do it. @golfodds @vegasWATCH @middysworld what would spread be if a team of Airbuds played the 76ers? Now that it's been asked you must answer! Thoughts/context: Taught him everything he knows, ldo.